Walt Disney was always fascinated with sound and music, and felt they were every bit as important as image, story and animation technique. A visit to his theme parks demonstrates the point: every ride, every entertainment, every adventure has its own sound field, its own music. In his animated series of short films, he called Silly Symphonies, Disney experimented with stories told only with image and music – no dialog. He did cheat a bit in that the music had lyrics that helped tell the story - something akin to all those 1930s Busby Berkeley Gold Digger musicals from the 1930s, only more insipid. The basic idea was brought to it logical extension in his 1940 masterpiece, Fantasia, which is a series of more or less unrelated experiments in free form animation, some without any representation to speak of, and now entirely without the help of a lyric. Fantasia accomplished one more advance of the Disney principle: it made use of serious concert music entirely. Most, but not all, of its music was programmatic, that is, the music supported a pre-existing story line. The final step in the development of the formula would have been to devise a full-length animated feature using non-representational music. This, Disney was never to do. It may not even have been practicable given his audience – then or now. 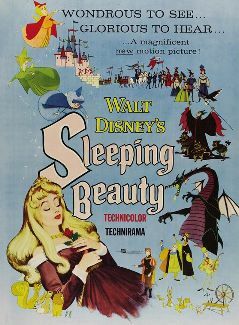 Sleeping Beauty, the Disney studio's second feature in widescreen, was not so much a departure, as a byway along the natural development of the art form as Walt conceived it: a feature length animated film based on a familiar fairy tale, and adapting the music of Tchaikovsky's ballet score for the same subject. That adaptation gives itself away from the moment we hear its familiar, sappy Disney chorus that could sugarcoat the Nazi invasion of Poland, given half a chance. The choir and the lyric makes it clear that we are in the Fantasyland of Tinker Bell and not the Haunted Mansion of New Orleans Square. 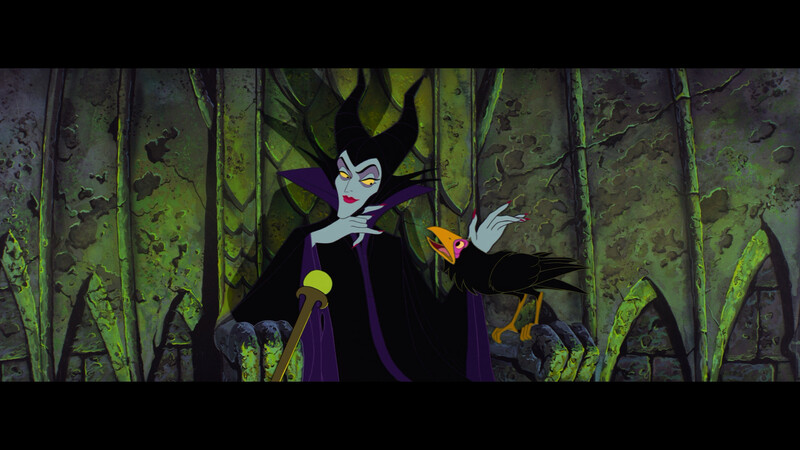 Tchaikovsky begins his score at the arrival of the evil and jealous fairy queen, Carabosse - here named Maleficent – with some of the most terrifying moments in all Western music. 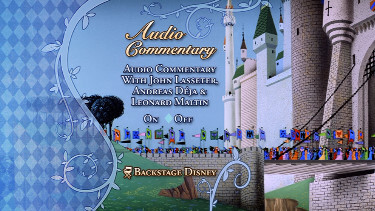 [See my review of the great recordings of the ballet score HERE] Since he didn't want his audience of young children to run screaming out of the theatre just as the curtain opens, Disney, sanely, but sadly for the adults, begins with the preparations for Aurora's name day. The palace is giddy with optimism, a feeling that has no better emissaries than the three fairies, Flora, Fauna and Merryweather. They are interrupted in the offering of their presents to the little one by Maleficent, not the least bit pleased she wasn't invited. The tone of her voice is unmistakable as she intones her curse, but the music hasn't yet caught up with Tchaikovsky, even though the tunes are familiar. For that, we must wait a bit longer. 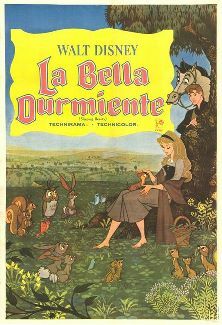 Clyde Geronomi's previous work included all the major Disney animated features from the early 1950s (Cinderella in 1950, Alice in Wonderland in 1951, Peter Pan in 1953 and Disney's only movie in true 2.55:1 CinemaScope, Lady & the Tramp in 1955). 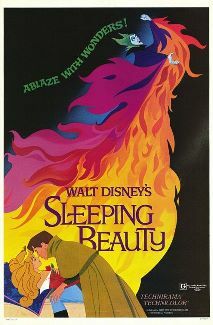 Though credited as supervising director, Sleeping Beauty is really the vision of its young art director, Eyvind Earle. Hired by Disney in 1951, Earle immediately set to work on solving the problem that Walt had given him: how to make this fairy tale different from previous efforts like Snow White or Cinderella (which don't have much in common with each other either.) 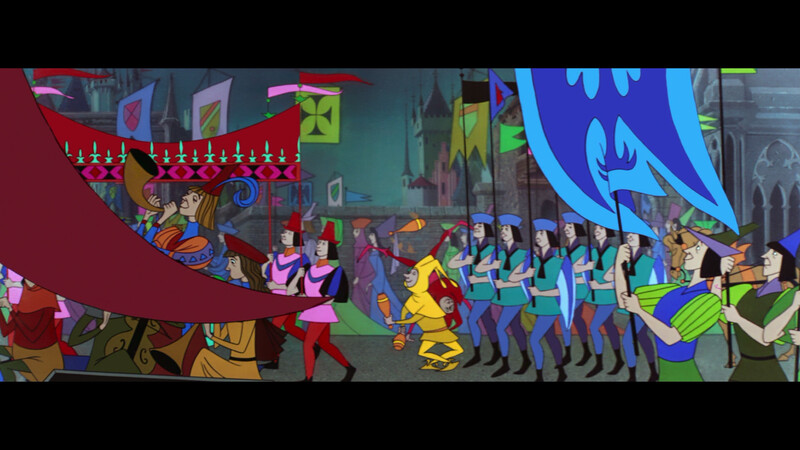 Disney gave Earle a free hand in developing the look of the movie, whose medieval setting demanded a subtlety of expression not used previously in Disney animation. Over the six years of its gestation, longer by far than any Disney film before or since, it became clear that this was going to have to be an expensive film if done right. And done right is what Uncle Walt was all about. His idea was to create "a moving illustration" by which he was referring to medieval illustrations, paintings and tapestries. 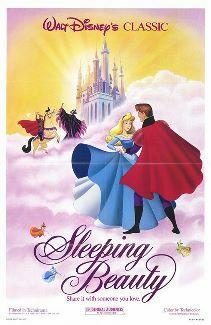 There is a stylized two-dimensional look to Sleeping Beauty as objects slide in and out of the foreground and middle ground. (Olivier's Henry V comes to mind.) We also find an enormous amount of detail in the middle and backgrounds, more so than for the characters themselves. 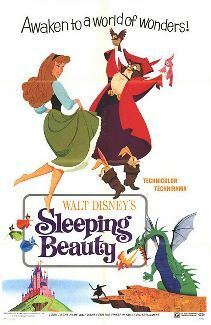 Sleeping Beauty was the first of only two Disney films to be shot in Super Technirama 70. In one of the making-of bonus features, Walt Disney hold up two strips of film to point out how much larger the negative frame was, inviting his artists make more use of the space. The technology wagged the art, and vice versa. The orchestral score was recorded in stereo as things neared the end, though the dialogue was all done much earlier in the production. Much of the singing was done by Mary Costa, very much at home in the upper range of the voice so she could be convincing as a young girl of sixteen. I saw Miss Costa on the opera stage in 1958 and I can attest to her loveliness of voice and person. 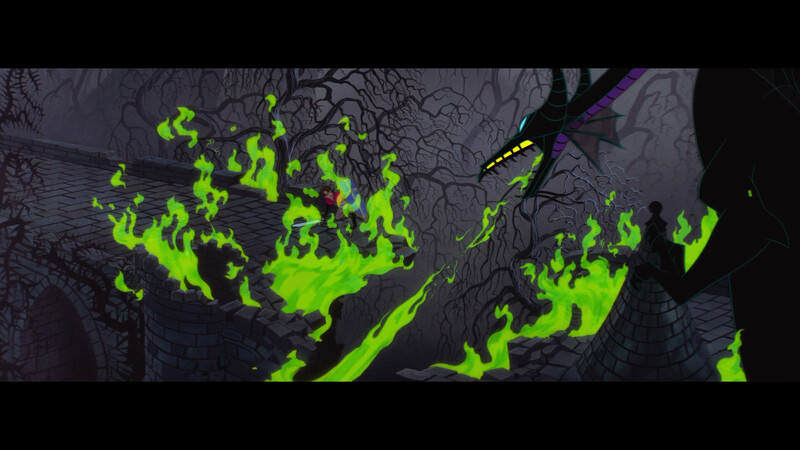 Sleeping Beauty would become the last Disney feature to use the expensive process of hand-inking the individual cells. 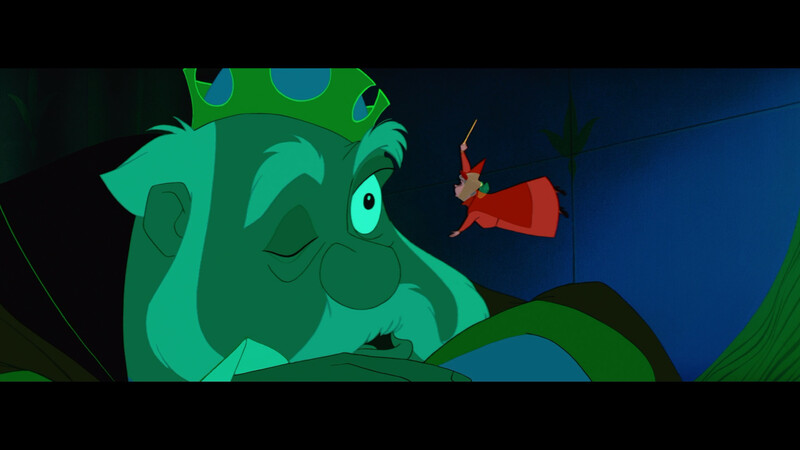 Perhaps the most important difference between Sleeping Beauty and everything else before it was its narrative and coloristic dynamism, propelled by Tchaikovsky's music (more or less). If you've ever heard Tchaikovsky's original score, you would realize at once the need for an extended color palette where dark, saturated colors would become paramount. Indeed, never before had there been such a need for such blacks and intensely saturated variations of purples, reds and greens. The scenes of Aurora's imprisonment and rescue are some of Disney's best work: despair, hope and courage all realized in moving paintings – at times, still and wistful, at other times, dynamic and terrifying. Tchaikovsky, finally vindicated. Subtitles English (SDH), French, Spanish, None English SDH, none NOTE: Subtitles available for the commentary as well! 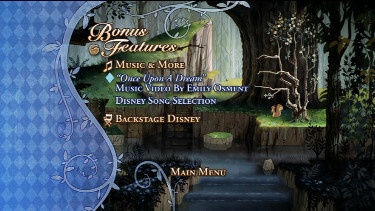 • Backstage Disney includes audio commentary for the film (John Lasseter, film critic Leonard Maltin, and Disney animator Andreas D�ja), Princess Fun Facts (pop-up trivia fact option while watching the movie), "Grand Canyon" short (1959 Oscar winner for best short subject film and features the music of Ferde Grof's "Grand Canyon Suite"), and The Peter Tchaikovsky Story. • Trailers/promos for other Disney films, including the upcoming theatrical release "Princess & The Frog" and the next Platinum Edition DVD release, "Pinocchio." 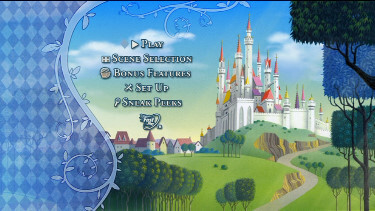 * Briar Rose's Enchanted Dance Game: Learn to Waltz, taking on the role of Princess Aurora or Prince Phillip. • "Sleeping Beauty" Fun With Language Game. • Alternate Opening (3:28) is recreated with storyboards and sketches. 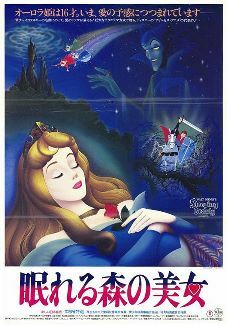 • Original Disneyland Sleeping Beauty Castle walkthrough attraction. * "Four Artists Paint One Tree" (16:08) is a 1958 featurette that has four Disney artists (Marc Davis, Eyvind Earle, Joshua Meador, and Walt Peregoy) painting the same tree, each showing their own personal style. Walt Disney himself encourages each to "be themselves." * Live-action reference footage. 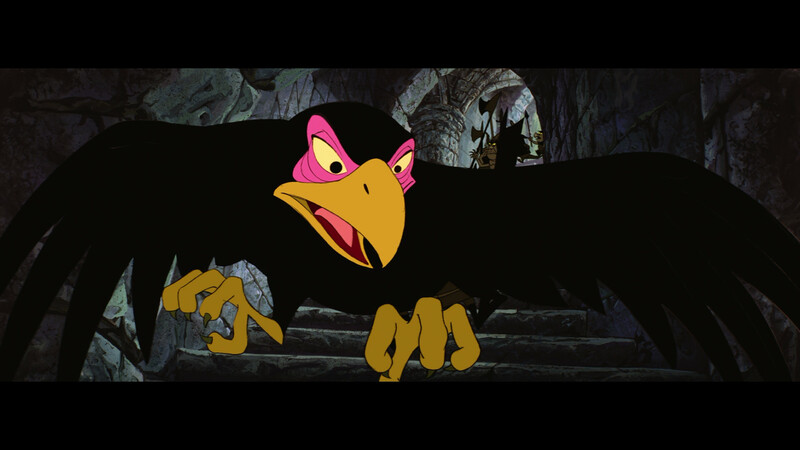 See three of the black and white films that were shot to aid the animators. 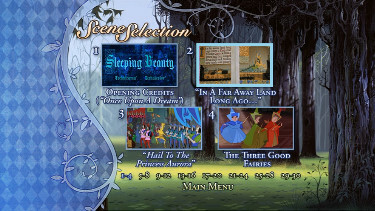 * Backstage Disney includes audio commentary for the film (John Lasseter, film critic Leonard Maltin, and Disney animator Andreas D�ja), Princess Fun Facts (pop-up trivia fact option while watching the movie) (subtitles available for commentary on the Blu-ray), "Grand Canyon" short (in HD) (1959 Oscar winner for best short subject film and features the music of Ferde Grof's "Grand Canyon Suite"), and The Peter Tchaikovsky Story (in HD). The Peter Tchaikovsky story was featured on the 1959 Walt Disney Presents anthology. * Trailers/promos for other Disney films, including the upcoming theatrical release "Princess & The Frog" and the next Platinum Edition DVD release; "Pinocchio." • Briar Rose's Enchanted Dance Game: Learn to Waltz, taking on the role of Princess Aurora or Prince Phillip. 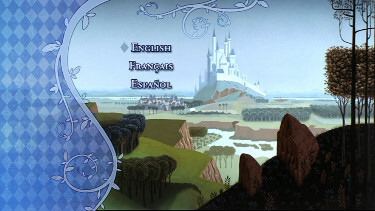 • "Sleeping Beauty" Fun With Language Game. This one is definitely for VERY young children who must identify the most basic of words using visuals from the film. • Alternate Opening (3:28) . • "Four Artists Paint One Tree" (16:08) (in HD) is a 1958 featurette that has four Disney artists (Marc Davis, Eyvind Earle, Joshua Meador, and Walt Peregoy) painting the same tree, each showing their own personal style. Walt Disney himself encourages each to "be themselves." • Live-action reference footage. See three of the black and white films that were shot to aid the animators. NOTE: I focused far more on the Blu-ray in this comparison only noting the additional (or omitted) features compared to the SD-DVD 50th Anniversary. On the image: Being animation we typically don't notice large improvements in detail, although it is there - it is never at the same level as with advanced resolution in live action. What is most prominent in the Blu-ray over the SD-DVD image are the way colors are rendered. They seem far more pure without a hint of bleeding. This reinforces the tightness of the image and gives it superior sharpness. I suggest clicking on a few of the expandable Blu-ray captures to see the greater depth of the 1080P image quality. Colors aren't overly brilliant, as some may expect from Technicolor, but they are strong and consistent and can occasionally really jump to life. The Blu-ray DTS-HD Master Audio 7.1 is still, surprisingly, a shade flat at times but overall I thought it really enhanced my personal viewing experience. 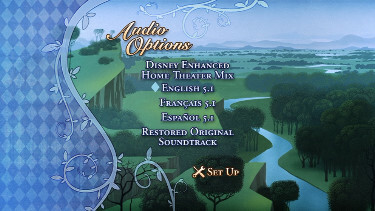 The only other option (no DUBs) is the Restored Original Theatrical soundtrack. This had some perceived buoyancy to it that picks up where the 7.1 leaves off. Quite a different mix but it was quite impressive as well. 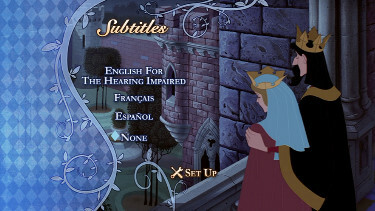 Reinforcing my option that this Blu-ray is not region FREE (Region 'A' locked), there are only English (SDH) subtitles available (also available for the dialogue in the commentary). Technically the feature disc is dual-layered taking up about 35.1 Gig of the 50 Gig space but the feature itself covers only 17.9 Gig. The rest of the disc space is filled with the extensive supplements. The extras, listed in full above, are endless. I'm certain no fan of the film will be left wanting and it may take a few nights to faithfully get through them all (Personally, I admit that I have not yet). The commentary is exceptional. 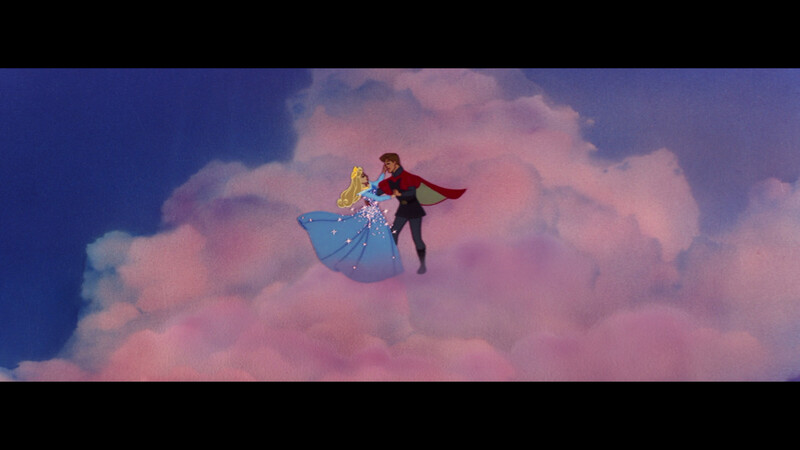 John Lasseter (taking the lead often), film critic Leonard Maltin, and Disney animator Andreas D�ja show a contagious enthusiasm for Sleeping Beauty and can highlight a number of anecdotal stories associated with Disney and the production. I think it is one of the more information-filled commentaries I have heard this year despite the short length of the film. I expect the trio could have talked for 3 additional hours. I'll add that some of the featurettes on the Blu-ray are in 1080 resolution ("Four Artists Paint One Tree" (16:08),"Grand Canyon" and The Peter Tchaikovsky Story). 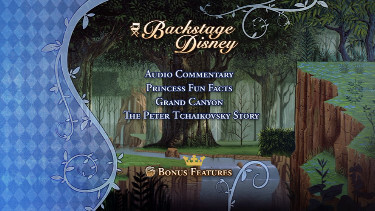 * Backstage Disney includes audio commentary for the film (John Lasseter, film critic Leonard Maltin, and Disney animator Andreas D�ja), Princess Fun Facts (pop-up trivia fact option while watching the movie), "Grand Canyon" short (1959 Oscar winner for best short subject film and features the music of Ferde Grof's "Grand Canyon Suite"), and The Peter Tchaikovsky Story. 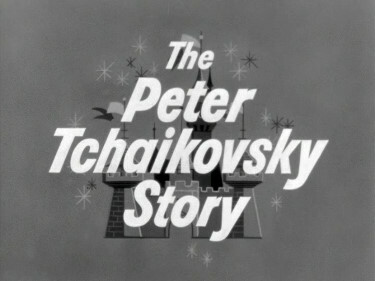 The Peter Tchaikovsky story was featured on the 1959 Walt Disney Presents anthology. It was a historic telecast due to the fact that home viewers could listen in true-stereophonic sound, by turning on two additional radios with ABC simulcast of the necessary stereophonic channels. Disney explains the process at the beginning of the featurette. You can choose between this version and the version that replaces Disney's explanation. Although the featurette was first broadcast in black and white, it was shot in color. The remaining color footage is here on this DVD set. * Naturally, there are trailers/promos for other Disney films, including the upcoming theatrical release "Princess & The Frog" and the next Platinum Edition DVD release, "Pinocchio." * "Sleeping Beauty" Fun With Language Game. This one is definitely for VERY young children who must identify the most basic of words using visuals from the film. 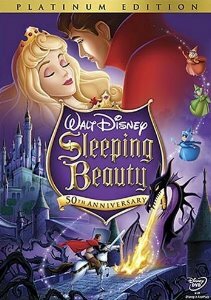 * Picture Pefect: The Making Of "Sleeping Beauty" (43:32) A wonderful documentary detailing the making of the movie. Features interviews with animators and Mary Costa, who is still beautiful today. Watching this will definitely enhance your appreciation for this movie as the artistic masterpiece that it is. * Eyvind Earle: The Man and His Art (7:33) is about the man responsible for the artistic backgrounds and overall look of the film. 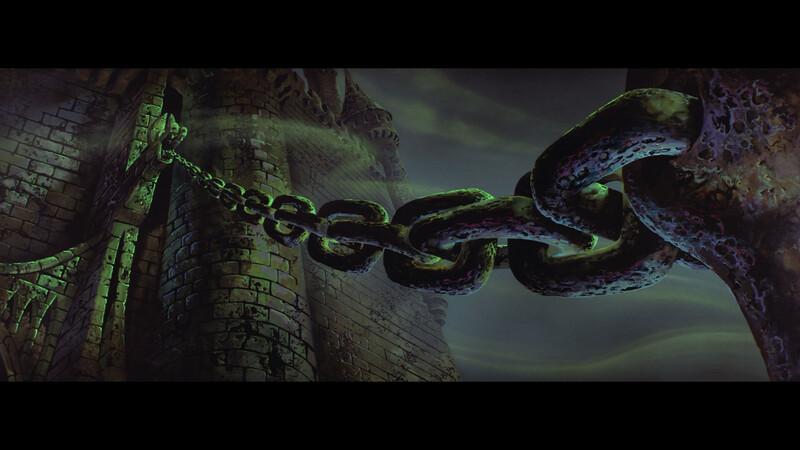 Disney stepped up everyone's game at the animation studio by having Earle oversee the design. Features interviews with Alice Davis and John Canemaker. * Alternate Opening (3:28) is recreated with storyboards and sketches. After viewing this, I'd say they made the right decision, as the music intended for this sequence was more pop-oriented and not fitting the classical Tchaikovsky score. * Original Disneyland Sleeping Beauty Castle walkthrough attraction, unseen for years, presented in a virtual digital recreation which is BREATHTAKING. Almost like being at Disneyland. "Tour" it yourself, or with host Tony Baxter explaining your tour as you go through. There is also a featurette explaining the history of the walkthrough. * Sequence 8 (Forest Scene) (5:30) is a featurette that shows the detail and labor that went into this sequence put together by Disney's famous "Nine Old Men." This sequence alone cost the studio over $10,000. It is also interesting to note that only about 8 drawings were able to be done per day because of the precision required; considering it takes 24 to make a second of film, well...you do the math. * "Four Artists Paint One Tree" (16:08) is a 1958 featurette that has four Disney artists (Marc Davis, Eyvind Earle, Joshua Meador, and Walt Peregoy) painting the same tree, each showing their own personal style. Walt Disney himself encourages each to "be themselves." An excellent lesson for budding young artists. * Live-action reference footage. See three of the black and white films that were shot to aid the animators. 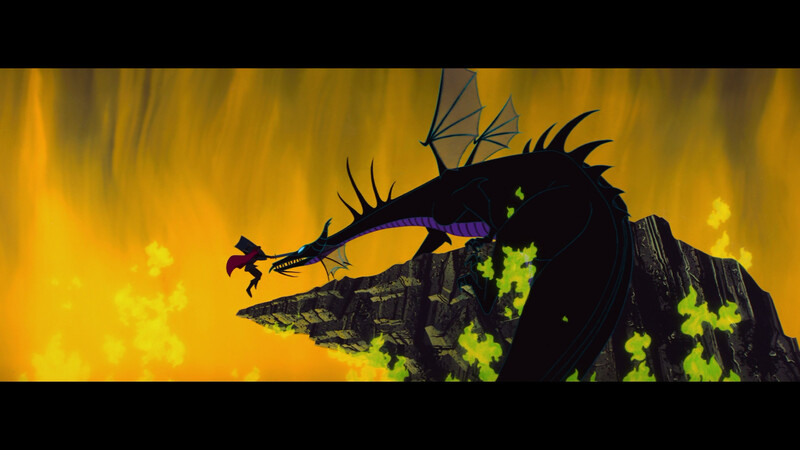 Especially fun to watch is the sequence where Prince Phillip fights the dragon." 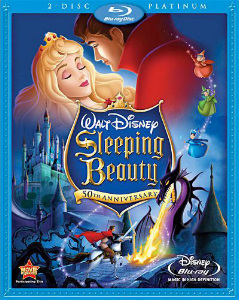 The Blu-ray also has BD-LIVE feature (that the SD obviously does not) described as 'innovative features premiering on Sleeping Beauty include Chat and Create Custom Video Messages With yoru Friends As You Watch The Film, Shop For Add-Ons and Downloads, Maleficent's Challenge Game, Living Menus Real Time Castle Environment...' and my edition actually came with a paper sleeve of the SD-DVD (disc 1) taped to the front for further enticement to buying the upgraded resolution edition. The price difference between the two editions if less than $4. Even if you don't have a Blu-ray player yet - you should indulge - since you get the first disc of the SD package included anyway! This is an unfathomably extensive release. One of the family classic now looking as good as it ever has for home theater viewing. The Blu-ray, with its stellar image, strong audio and lovingly-created extras (plus the bonus of the SD-DVD included) is warmly recommended.